For a meal on the go, whether you’re looking to lose weight, gain muscle or just need an energetic boost, reach for Forever Lite® Nutritional Diet Program. Mixed with milk or your favorite fruit juice, Forever Lite delivers a nutritious kick of vitamins, minerals, proteins and carbohydrates. 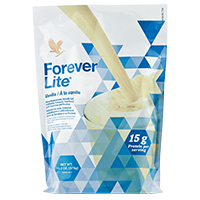 Mixed with skim milk, soy milk or fruit juice, a Forever Lite shake can be a healthy, tasty way to manage your weight. If used as a meal replacement, eat at least one nutritiously complete, low-calorie meal a day, including fresh fruit, vegetables, whole grains and lean protein.